Yellow anaconda (snake) skins pegged to dry by indigenous people in Argentina. Women raise Burmese pythons at a small farm on Hainan Island, China. Saltwater crocs are the reason many beaches are not open for swimming in northern Australia. Saltwater crocodile eggs collected in the Northern Territory, Australia. A collector captures a yellow anaconda in Argentina. 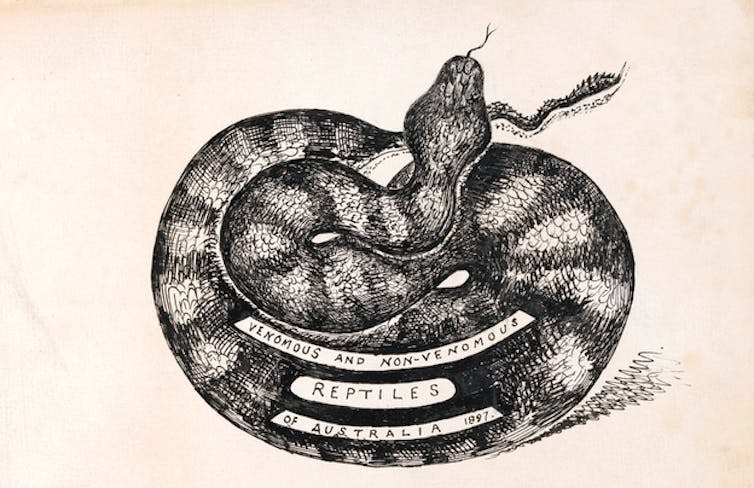 James Bray, Venomous and Non-Venomous Reptiles (1897). The idea that Australia is home to many of the most deadly snakes in the world is based on animal research from the 1970s that looked at the effect of 25 venoms on mice. While not entirely untrue, the claim is also not quite right. A more accurate statement might be that Australian snakes are the best mouse killers in the world: they’re able to kill the most mice with the smallest amount of venom. While that’s clearly bad news for mice, how does it translate into human risk? The occurrence and severity of a snake bite depends on a complex interaction between snake behaviour, venom toxicity and human behaviour. Significant factors include how toxic the venom is; how much of it is injected by the snake; and how humans encounter and interact with snakes. Australian snakes have very toxic venoms but inject tiny amounts at a time because most have short fangs. The only evidence of a brown snake bite may be a small scratch, for instance, but the venom is so toxic that it quickly results in the person’s blood failing to clot, which puts them at risk of bleeding to death. Mulga snakes (King Brown) can deliver larger amounts of venom, but have one of the less toxic venoms of dangerous Australian snakes. Historically, tiger snakes and death adders were responsible for most deaths. They’re widely distributed throughout Australia and their bites cause paralysis. Before the advent of modern intensive care, paralysis was – more often than not – fatal. But with the development of antivenom in the 1930s and 1950s, and machines that can breathe for people, paralysis from snakebite has become uncommon. Taipans also cause paralysis, but are a rare cause of snakebite in Australia (in contrast to Papua New Guinea where they cause much havoc). In modern times, brown snake bites have become more common and now cause the majority of such deaths in Australia. This group of snakes appears to have thrived despite human invasion and the destruction of natural habitats. 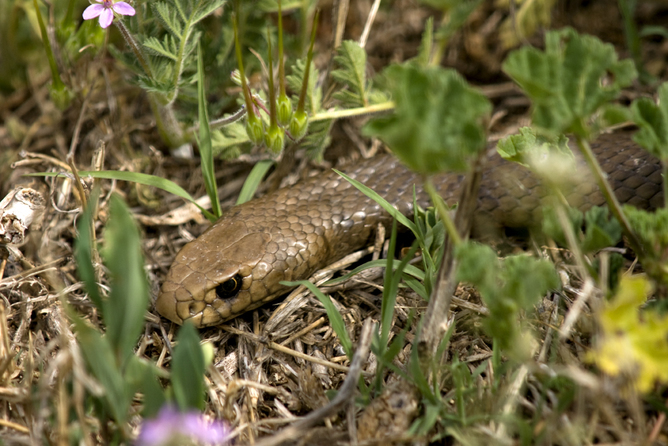 Brown snakes are now the most common cause of severe snake envenoming in Australia, according to the Australian Snakebite Project. Eastern Brown Snake (Pseudonaja textilis) is one of the group of snakes that cause the most severe envenomings in Australia. They cause the majority of the one to five deaths from snakebites each year, usually from early collapse and cardiac arrest. Unfortunately, antivenom is unlikely to help these people because cardiac arrest happens within 30 minutes of the bite. Early basic life support from bystanders is most important for snake bites because this can keep someone alive until they’re transported to hospital. Severe snake envenoming is actually quite rare in Australia, with only about 100 cases each year. After brown snakes, red-bellied black snake bites are the next most common, but they rarely cause severe envenoming and occur only in eastern Australia. Tiger snakes, which continue to account for a significant number of bites in southern Australia, are one of three snakes found in Tasmania and account for almost all serious snake bites in Victoria. They cause all three major types of toxicity: coagulopathy (making a person’s blood unable to clot), neurotoxicity (paralysis) and myotoxicity (muscle damage). Snake bites are treated with antivenom, which needs to be given as soon as possible after a bite to be effective. The Australian Snakebite Project has demonstrated that only one vial of antivenom is required to treat all cases of snake envenoming. But many of the effects of snake envenoming are irreversible in the short term (muscle damage, for instance, and paralysis), so antivenom won’t help for these. Instead, treatment in intensive care will support the patient while the body repairs. This is why antivenom needs to be given early. Using antivenom comes with the risk of an allergic reaction, so it’s important that only people with envenoming be treated. Recent research measuring snake venom enzymes in blood appears to identify envenoming early. It is hoped that development of bedside testing of these enzymes will improve early recognition. Although the effects of venom are reasonably well understood, why they cause severe toxicity in humans remains unclear. After all, we are not prey for snakes; small reptiles (such as skinks) or small mammals (such as marsupial rats) are their primary targets. The toxicity we see in humans, such as venom’s clotting effects that commonly occur with brown snake, tiger snake and taipan bites, is most likely a chance occurrence. This idea is supported by recent research that shows many animals, including rodents and skinks, are highly resistant to the clotting effect of snake venom. But they’re highly susceptible to the neurotoxic effects of snake venoms. In most other parts of the world, vipers, which have much larger fangs, are much more common. They inject ten or more times as much venom as Australian snakes, but have less toxic venoms. The other major difference is that vipers can cause local skin and tissue damage and, in some cases, this can lead to amputation. Unlike the human impact of Australian snakes, viper envenoming is a huge public health issue worldwide. Many Australians pride themselves on the belief that, of all the countries in the world, their snakes, spiders, jellyfish, centipedes, fish, ticks, bees and ants are the worst. And it’s easy to believe they’re right. After all, there’s a 37-year-old list that says that 21 of the 25 most toxic snakes in the world are all from Australia. And aren’t funnel-web spiders, box jellyfish, stonefish and cone snails all dead-set killers? But is Australia really the most lethal nation on earth when it comes down to it? Actually, no, it’s not. And the reason is simple. It’s useless to measure how dangerous something is based solely on laboratory lethality tests. Venom toxicity and the number of mice killed with a snake’s average venom yield, for instance, are interesting only from an academic perspective. If you happen to be one of around 100,000 people who die of snake bites around the world in any given year, such facts are irrelevant. The same goes for just about any other venomous creature we might like to proudly declare as the planet’s most lethal. The Eastern Brown Snake (Pseudonaja textilis) and its relatives cause most of the bites and fatalities in Australia. While Australia has spiders, jellyfish and other animals with lethal venom, the reality is that bites and deaths are rare. In other words, despite very toxic venoms, these creatures don’t bite enough people to cause major problems. Even when they do bite, it’s rare for snakes to inject venom (or “envenom”), less than 450 of 3,000 snakebite cases a year, for example. Death is even rarer (two to three cases a year). Animals that cause the greatest burden of human suffering and death are the ones we need to be most worried about, and from that perspective, the most dangerous are not Australian. Consider snakes, one of the most feared groups of venomous animals in the world. If we want to know which snakes are the most dangerous, we should consider the global, rather than individual impact. That view shows three groups of vipers that collectively span almost all of the tropical developing world – and have a huge impact on human health – best deserve the title of the world’s most dangerous. Perhaps the most dangerous of these three genera is a diverse group of small, seemingly innocuous vipers that range from Sri Lanka and India, across the Middle East and through a huge part of the northern half of Africa. West African carpet viper (Echis ocellatus) from Togo – member of a genus of small vipers that are the world’s most dangerous snakes. These snakes got their name from the patterns that adorn their bodies. They are small- to medium-sized vipers believed to injure and kill more people each year than any other species in the world. Yet they don’t make the list of most toxic snakes mentioned above at all. In just one hospital in Nigeria’s north-eastern Gombe State, 5,367 victims of carpet viper envenoming were treated over a two-year period. But for the use of an effective antivenom, the fatality rate may have been as high as 35% to 45%. That’s more cases at one hospital in two years than all the recorded cases throughout Australia in ten. Their huge range across a vast swathe of the rural tropics brings carpet vipers into contact with hundreds of thousands of people each year. And while nobody has a tally of just how many lives they affect, international experts all agree that when it comes to the most dangerous snake, these vipers have no competition. 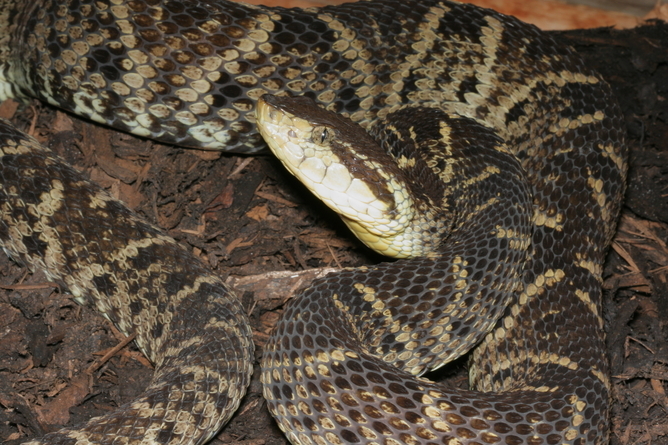 In Pakistan, India and Sri Lanka, carpet vipers give way to the larger Russell’s viper (Daboia russelii). A Russell’s viper (Daboia russelii) arguably the most dangerous snake in Asia with a potent cocktail of destructive toxins in its venom. This pugnacious viper lurks in fields, rice paddies and farmland from Pakistan through India, Nepal, Sri Lanka, Bangladesh, Myanmar, Thailand and Cambodia, as well as Taiwan and southern China. There’s a distinct, disjoined population of an equally dangerous sister species (Daboia siamensis) in eastern Java and the lesser Sundas in Indonesia. Like the victims of carpet vipers, those bitten by these snakes bleed uncontrollably and often fatally. At the same time, local tissue destruction and necrosis, acute kidney injury, neurotoxic paralysis, shock, and cardiac arrhythmia can produce a terrifying clinical picture that can very quickly lead to death. Latin America, from Mexico to Argentina, is home to more than 40 species in the genus Bothrops, lancehead pit vipers. Collectively, this very diverse group is responsible for many of the estimated 150,000 or more cases of venomous snakebites in Central and South America each year. Venezuelan lancehead (Bothrops venezuelensis) one of a large, widely distributed genus of dangerous pit vipers that cause enormous misery in Latin America. Lancehead bites produce devastating local tissue injury with oedema (or fluid retention), bruising, skin and muscle necrosis and fluid-filled blisters. Permanent disability including amputation is common. Systemic effects involving stopping the ability of blood to clot, platelet destruction, shock, acute kidney injury and thrombosis present doctors with a complex medical emergency that – even with the best care available in a modern hospital – can still ultimately prove fatal. Since many cases occur in rural areas, away from good medical care, poor outcomes are common. 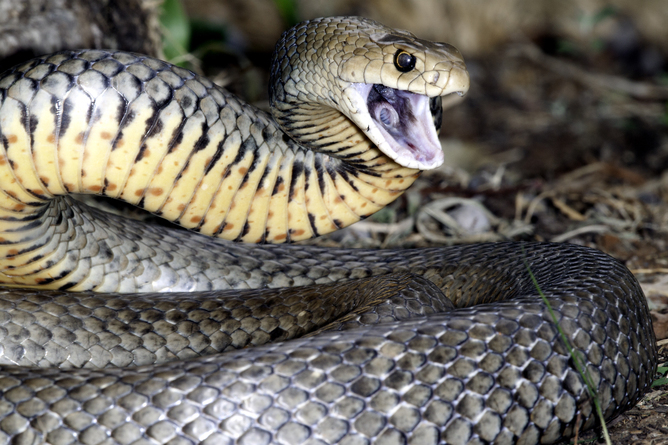 Within Australia, the low mortality from snakebite (and other types of venomous injury) is very much the product of decades of research and excellent clinical care, not to mention safe and effective antivenoms. It’s the lack of these same attributes elsewhere in the world that renders snakebites such a potentially life-changing (if not, life-ending) public health issue. David will be on hand for an Author Q&A between 11am and noon AEDT on Tuesday, January 12, 2016. Post your questions in the comments section below.